Summer festival season is upon us, and if you haven’t got the time (or the money) to attend one of the UKs many music, arts, culture or food festivals – don’t worry. 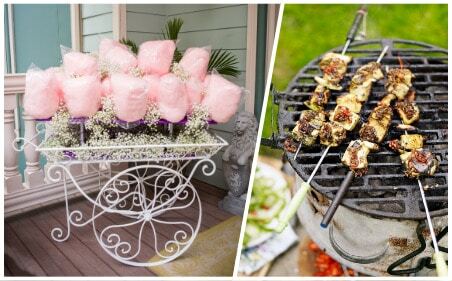 With a little creativity, you can take outdoor living to another level by hosting a festival themed garden party! We’ve put together this guide to help you organise a backyard festival set to rival Glastonbury. Almost. No camping, no muddy boots, and no queuing for the (often less than sanitary) toilets in the dead of night! All the fun of a festival, but with a garden-party makeover – and a crowd of family and friends. What’s not to love? Obviously, a big running theme among most festivals is music, and while you’re the official event organiser here – it’s only fair to share. Create a shared Spotify playlist, and allow your guests to add their favourite songs! It’ll be an eclectic mix of tunes, but that’s all part of the festival experience, right? But, it’s no good having a playlist without something to play it on. 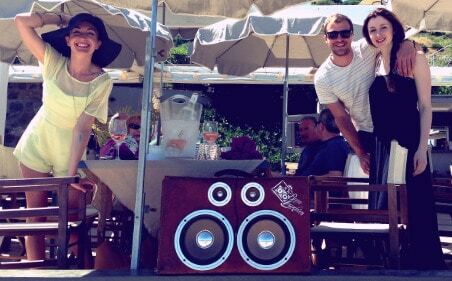 To add some festival flair to your party, it’s a good idea to invest in some portable speakers that can be used outside. We absolutely love these stylish speakers from British company Bass Trunkies who specialise in creating rechargeable, portable, vintage suitcase speakers. One thing is certain – if you want your back garden festival to be a success, don’t skimp on the decor. Nothing transforms an outdoor space like some carefully placed props, decorations and some beautiful lighting for when the sun goes down, but the party continues. 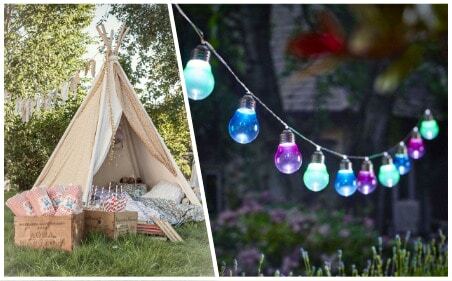 We love these beautiful string lights from London Garden Trading, because of their fun and festive colours, and the fact that they are solar powered. And for a mini glamping experience, you could erect some decorative teepees on your lawn. A few garden canes lashed together and draped with vintage sheets is an easy and inexpensive way to create a quirky chill-out spot for you and your guests to relax in. For food, we suggest serving something simple. The smell of sizzling onions and hot dogs has a distinctly festival-like feel to it, so why not opt for simple barbeque food to keep your guests happy. We love this barbeque chicken skewers recipe from food blogger Rachel Phipps – it’s simple, delicious and perfect for entertaining. And when it comes nibbles and snacks, you can afford to be a little more extravagant. 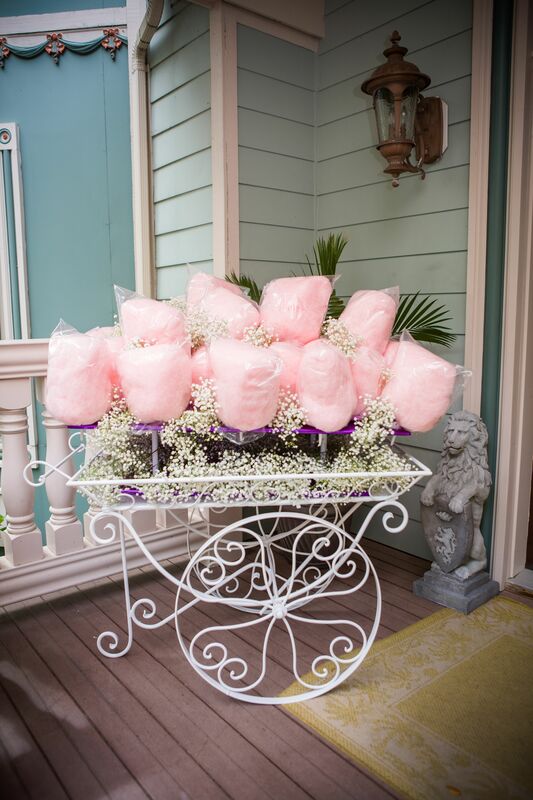 Nothing seems more carnivalesque than a stick of candyfloss! You could buy it in bags, but for a theatrical twist, opt for a home candy floss machine like this one from Selfridges. It’ll definitely be a hit with the kids! We saved the best (and possibly the most important) for last. No festival is complete without some drinks – and in order to serve them you need a bar! 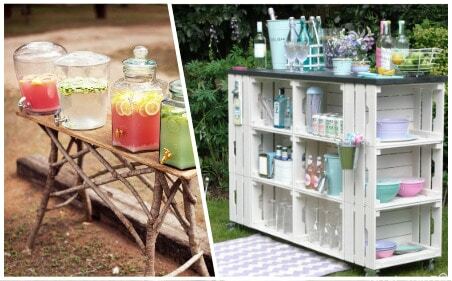 You don’t need to go all out and build a bar – although it could look amazing. Your festival bar could be something as simple as an ice-filled wheelbarrow brimming with bottles of your favourite beers and wines. Or, you could opt for some drinks dispensers like this one from All Things Brighton Beautiful and fill them with cocktails, punch, whatever you fancy! So there we have it! A festival in your back garden – and all of it at a fraction of the cost of spending a weekend away at a music festival. Food, drink, music and fun – and all only a few feet from your own back door. Glastonbury, eat your heart out!